Fred. 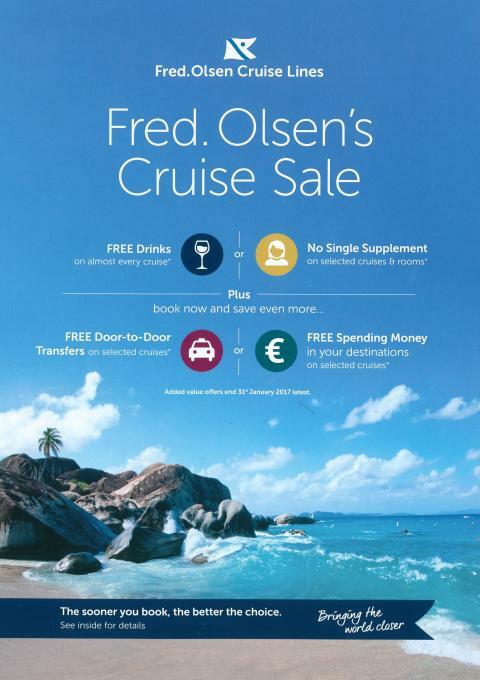 Olsen Cruise Lines is today [1st December 2016] launching its new multi-strand ‘Cruise Sale’, as part of its New Year promotional campaign. The new promotion incorporates two great-value offers to tempt guests: ‘Free upgrade to the ‘all-inclusive’ drinks package’ and ‘No single-supplements’ and is valid for bookings made until 1st March 2017. Members of Fred. Olsen’s Oceans loyalty club booking between 1st and 27th December 2016 can take advantage of an exclusive booking period for two additional offers as part of its new ‘Cruise Sale’ – ‘Free on shore spending money’ and ‘Free door-to-door transfers’ – after which time they will be available on general sale until 31st January 2017. ‘Our fantastic new ‘Cruise Sale’ has been designed to reward loyal Fred. Olsen guests, as well as targeting single-cruise bookers and removing any barriers for first-time cruisers. “With the recent changes in the political landscape, holidaymakers have been exercising a certain amount of caution when booking foreign travel. To try to alleviate any concerns that they may have, our new ‘Cruise Sale' focusses on ensuring that we continue to offer great value-for-money and that those all-important holiday ‘extras’ are covered, allowing guests to relax, safe in the knowledge that almost everything is included in their cruise price. In its New Year ‘Cruise Sale’, Fred. Olsen guests can book any 2017/18 cruise of five-nights’ duration or longer and benefit from a ‘Free upgrade to the ‘all-inclusive’ drinks package’*, available until 1st March 2017. Fred. Olsen is offering guests a ‘No single-supplements’ deal on a selection of 10 2017/18 cruise holidays**, available until 1st March 2017. A solo traveller can book from a selection of twin room grades without having to pay any sole-occupancy charge. Destinations available include Norway, the Caribbean, Spain, the Baltic and South America. In addition to these two sales initiatives, Fred. Olsen is also promoting ‘Free on shore spending money’ on 16 voyages in 2017, available until 31st January 2017, whereby guests can receive up to 125 Euros (or the equivalent value of currency relative to the cruise destination) once on board. ‘Free door to-door’ transfers (up to 250 UK-mainland miles) are also available to Fred. Olsen guests on three longer voyages in 2017***, until 31st January 2017. These are Boudicca’s 26-night ‘Bermuda & the America’s Cup’ cruise, Black Watch’s 27-night ‘Exploring the Fjords of the Arctic’ adventure, and Balmoral’s 32-night ‘Caribbean Discovery’ cruise.